Khan facetimes killer in prison, says "keep chin up, bro"
LiveFight » Boxing Boards » Worldwide Boxing Discussion » Khan facetimes killer in prison, says "keep chin up, bro"
The Bolton brawler, 31, chatted to Philip Merry – who is serving eight years in prison for manslaughter after beating to death dad-of-five Steve McKinnon in a pub fight in Leicester. 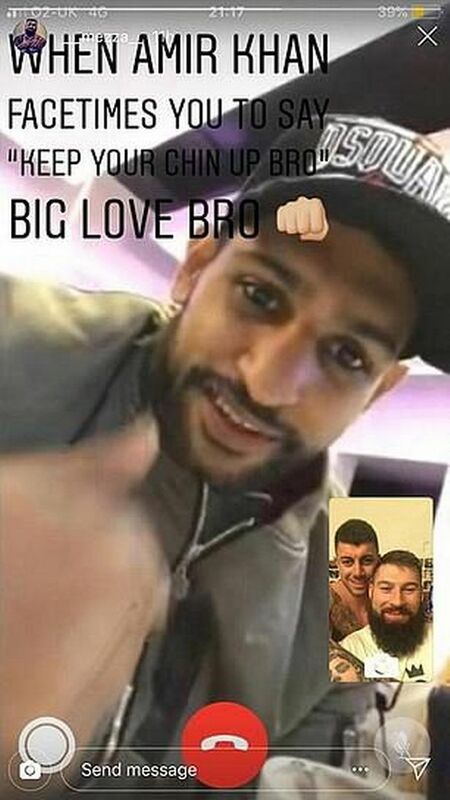 Merry, 31, posted a screenshot of the call on his Instagram story with the caption: “When Amir Khan Facetimes you to say ‘Keep your chin up bro’. The victim's widow branded Khan's behaviour “disgusting” – but he claims he was asked to make the call on a fan's phone and did not know the person he was calling was in prison. Mr McKinnon's widow Clare told the Sun: “Amir Khan is meant to be a role model. It's disgusting he would back someone like Merry. “He should be round here telling me to keep my chin up after what I've been through. “Merry is meant to be in prison serving his punishment, not getting morale-boosting messages from the likes of Khan. Merry was convicted of manslaughter along with Gurdev Sangha, 26, and Eugene Bell, 32, at Nottingham Crown Court in 2016. The three men attacked McKinnon by the Durham Ox pub in Leicester after he intervened when two of them launched an unprovoked attack on his stepson. He fell to the floor and suffered a brain injury, before dying in hospital two days later. Bell was sentenced to 10 years in prison. Prisoners caught using a mobile phone behind bars face up to an additional two years in jail. A spokesman for Khan said: “We can confirm that Amir was provided with a mobile phone from a fan and asked to speak to his friend (something that occurs frequently). “There was no prior notice that his friend was in prison or had been convicted of such a serious crime. Re: Khan facetimes killer in prison, says "keep chin up, bro"
Very silly for anyone to do but if you on the public eye it's stupid. Saying that it is probably a silly innocent mistake but he should do some explaining to the man's wife, not us. In fairness to Khan it is unlikely he was told yer man was in prison. Probably just handed the phone by a random stranger who told him his mate was going through a tough time. He’s just so unbelievably stupid. Surprised he can remember his own name.